Bryce Canyon National Park, 2-5 May days. 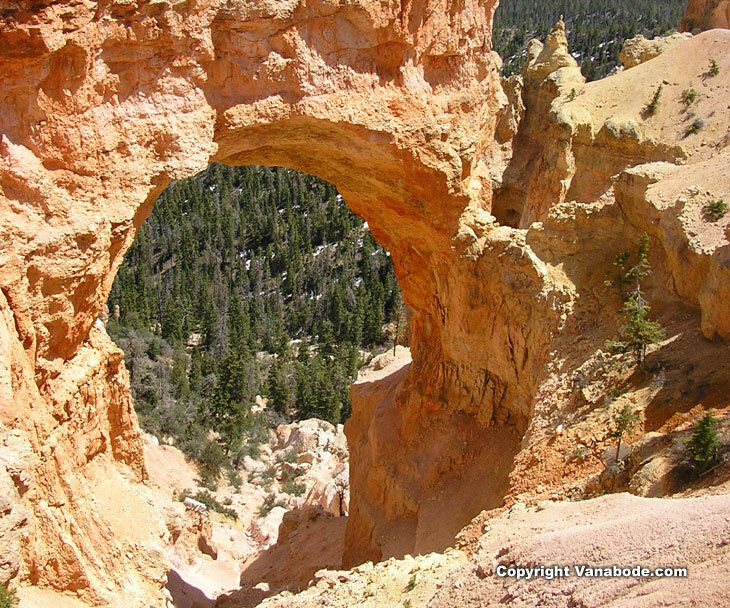 Visit Bryce Canyon National Park Visitor Center for free maps and information. 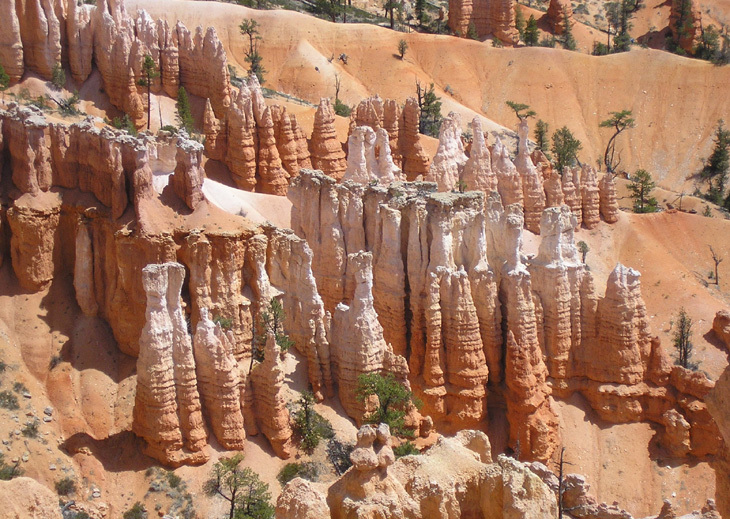 The infamous hoodoos of Bryce Canyon are a harmonious blend of orange, gold, pink, white. This soft limestone rock has been cut and formed by many years of ice and rainwater. The Rim Trail has gentle grades with minimal elevation changes. You will find some of the darkest and starriest skies in the country right here. I have rarely been so surprised, pleased and overwhelmed by such beauty while camping and traveling as I was in Bryce Canyon National park. This terrain is easily driven in our Vanabode. There are services near enough to stock up for weeks at a time so you can go out each day and do a new hike or explore a fresh picnic spot. I promise you if you come here you will not be disappointed. Bryce is extraordinary and well worth the effort to get here. Do not come in the summer as it is too hot to really enjoy it like you should. 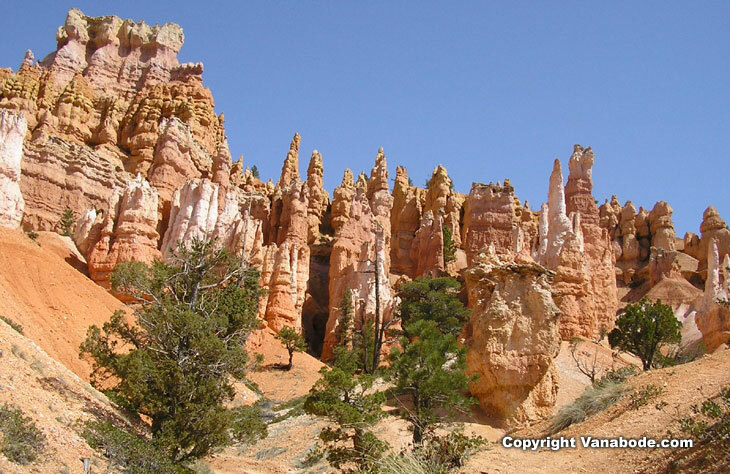 Hiking among hoodoos in Utah's Bryce Canyon. Who what? Hoodoo is a pinnacle or odd-shaped rock left standing by the forces of erosion. These very beautiful and bizarre rock spires come out of the Paunsaugunt Plateau in southwest Utah. This soft limestone rock has been cut and formed by many years of ice and rainwater. 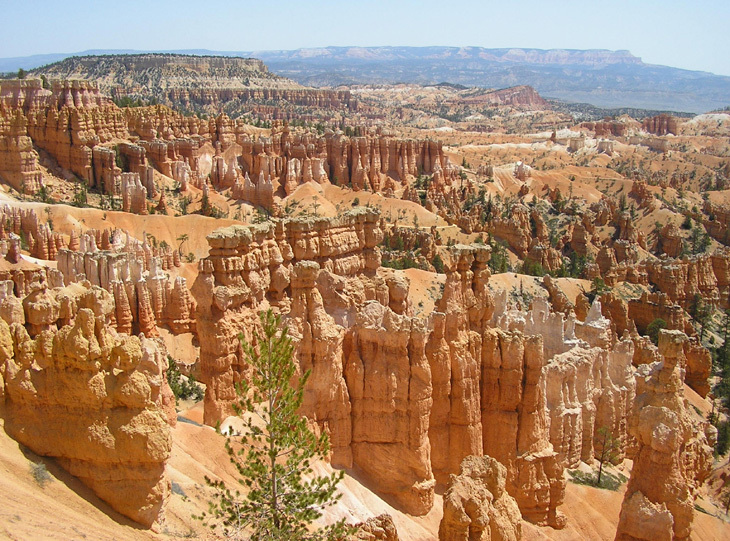 The basic color range of the hoodoos at Bryce Canyon are yellow, orange, and red which come from the mineral iron. The white, pink, and violet colors come from manganese mixed with dissolved calcium carbonate that create this limestone. But with all of these beautiful merging colors surrounding you the pictures you will take and the pictures you see in books don't do this park justice. Basically, the pictures you take will be for memory's sake. So, when you are walking among the hoodoos concentrate on the moment and the feelings of awe that will overcome you to help relive your pictures when you look at them later. Above: Picture of the Bryce Canyon Hoodoos that cover many miles of this beautiful and unique national park. If you aren't an outdoorsy type of person but still want to enjoy our national parks then Bryce Canyon National Park would be one of my suggestions. You don't have to go on any hikes to really enjoy the colors and magnificence of the hoodoos. If you don't want to hike down to the foot of the hoodoos and then back up the steep grade to the road like the Queens/Navajo Combination Loop, then walk the Rim Trail. The Rim Trail has gentle grades with minimal elevation changes. And, the best part is that it's paved and there are excellent views of the hoodoos from above. This trail is on the same level as highway 63 that goes through the park. Above: Picture taken while hiking the canyon trails. The temperature from the road that goes through Bryce compared to the temperature among the canyon hoodoos was drastic. Cool up top and hot on the trails. From May through September you can ride the free shuttle through the park. The only fee is the park entrance fee. The shuttle stops at the Visitor's Center and all of the 13 viewpoints so that you don't miss a photo op. If you don't want to mess with the shuttle then driving your vehicle can be just as easy. 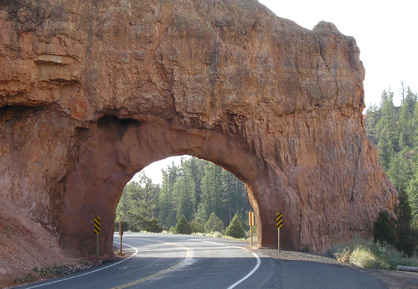 Highway 63 is 37 miles round-trip with many pull offs and viewpoints. Some national parks that we have visited such as Glacier National Park really needs to be enjoyed by hiking. Above: Picture of the Hoodoos colors. The white is more or less washed out iron in the rock. One of the reasons we have it so easy in these extraordinary parks is because we eventually ditched the big motorhome for the faster, cheaper, easier to drive Vanabode lifestyle. Now we live on $40 a day for two people while traveling everywhere in the United States we want. 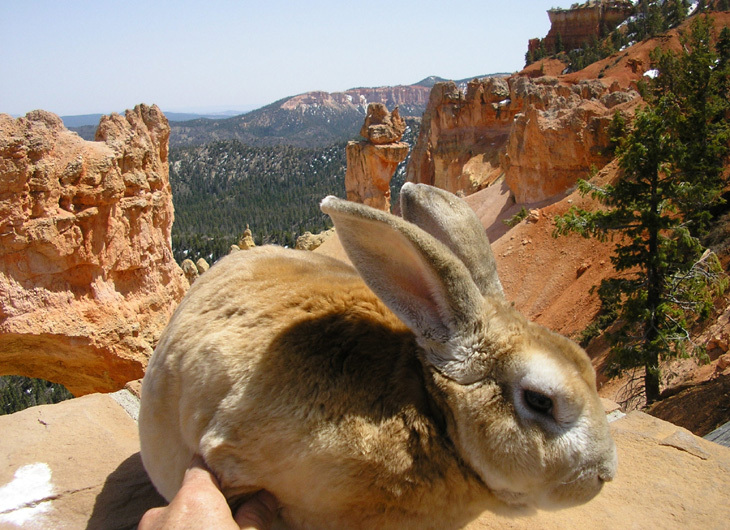 Above: Picture of Bugsy overlooking Bryce Canyon National Park. You and your family can get involved in a variety of activities at Bryce Canyon National Park so that you can really experience it to the full extent. From April to October the park hosts star parties because Bryce Canyon has some of the darkest and starriest skies in the country. With the clear mountain air combined with no light pollution you can see the Milky Way and many constellations. There is also full moon hikes and the hoodoos can be a little spooky looking, but you can't get this experience anywhere else. 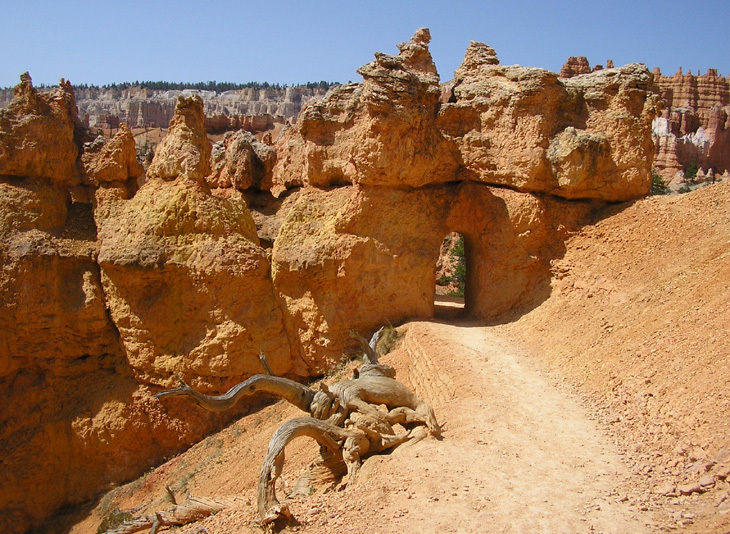 Bryce Canyon National Park also had horseback riding trails and ranger-led walk. Click for more pictures and how we travel and live here for $20 a day. 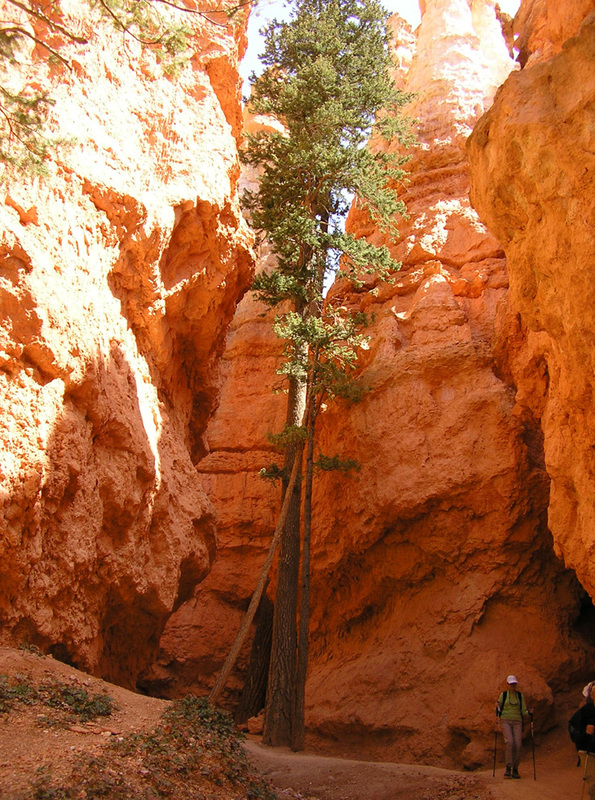 Above: Picture taken while hiking the Navajo Loop Trail in Bryce. Ruby's Inn is just north of the park entrance. This is where everybody stops before visiting the park and after visiting Bryce. There is plenty of parking, a motel, a campground, a gas station, post office, grocery store, and gift shop. Vehicles pulling trailers must leave their trailer in the trailer turn-around area or in the visitor center parking lot. Vehicles more than 25 feet long are not allowed at some of the viewpoints, so stop by the Visitor's Center to inquire about your RV or truck and trailer combo. There are no hookups at any of the campgrounds inside Bryce Canyon National Park. Click here to see one of our top five hikes of all times in Zion National Park if you prefer deep forest and rivers with your canyons. Beware though Zion is MUCH more crowded than these incredible Bryce hoodoos. 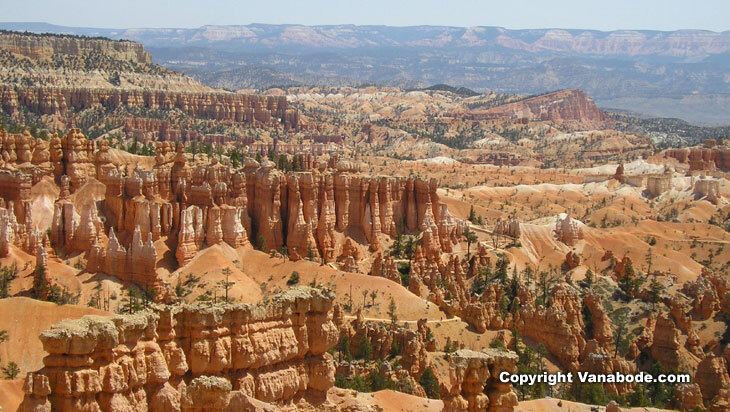 Above: Picture of a beautiful view of Bryce Canyon National Park trail that gets you above the Hoodoos. Jason's thoughts - The only hike I have every been on within a desert environment that comes even close to being this interesting is Zion. This park is super easy to explore from your car or by walking a rim trail leading to each trailhead. So you can park and go on a quick 15 minute hike or a four hour long trek. If you are anywhere near Bryce you should take one to two days to see it as it is extraordinary. There is nothing like this canyon in all of the United States. Kelly's thoughts - I'll admit that every time I saw a picture of Bryce I was never too thrilled about visiting. But with our travel route the way it was I couldn't ignore stopping at least for one day. Oh, what a limited imagination I have. Bryce Canyon is awesome and the hoodoos were more spectacular than I had imagined. To me hiking at the foot of the hoodoos instead of seeing the park from the street is more intimate. The colors of orange, gold, pink and white blending together in perfect harmony. Our plan now is to take about five days visiting Bryce Canyon. 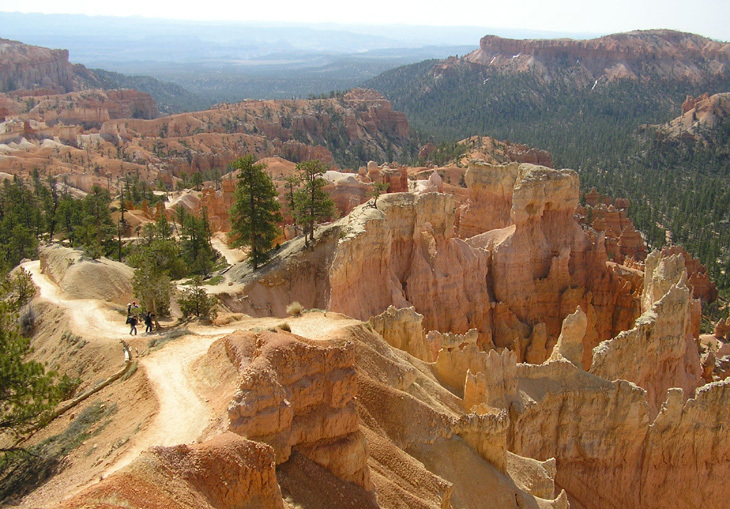 Travel info - Bryce Canyon is 78 miles northeast of Zion National Park and 112 miles west of Capitol Reef National Park. There is limited bus and RV parking. 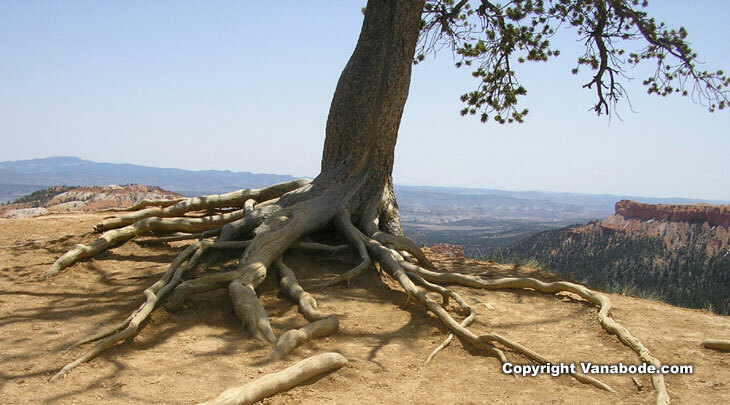 Visit all the viewpoints at Bryce Canyon. Travel 78 miles northeast from Zion or 112 miles west from Capitol Reef National Park to visit Bryce Canyon National Park Utah. Additional information on Arches National Park and Capitol Reef National Park in Utah.